In a mixing bowl, mash the tuna with a fork until well shredded. Combine it with the mayo, lime juice and salt to taste. Pre-heat the broiler, or you can use toaster oven. Divide the tuna mixture between four slices of bread. Divide the poblano strips on top of the tuna, and top with the cheese. Place under broiler, or in the toaster oven, until the cheese is melted. Place the remaining slices of toasted bread on top to close the sandwiches and serve. This was soooo good! Who knew pickled poblanos,cheese, and tuna were a match made in heaven! I will be sure to make tuna sandwiches like this all the time. Great recipe! Poblanos are usually very mild: https://patijinich.com/poblano_peppers/ If you happen to get a spicy one and you want them to be fairly mild, once you roast and cut them, let them soak in warm water mixed with a tablespoon of brown sugar for 10 to 30 minutes, then drain. Love tuna melts. Will definitely try this one. Also thinking about using roast beef or chicken. Thanks. Me too, Sandra! And beef and chicken will be great too. Hola Pati! Anne Hoffman here. Would you ever try this with chicken? I was thinking grilled chicken, rajas on top, and cheese on top of that. Not a tuna fan, and I don’t know that this would work with chicken salad. Que opinas? Oh give it a try…it will be great, Anne! This is an Amazing Delight, Many Thanks! I made this tonite – it was EXCELLENT!! So much fun grilling the poblanos. I had to put in 4 TB mayo into the tuna, 2 TB just wasn’t holding it together. We are having it again tomorrow. Thanks for an awesome recipe! I just finished making the pickled poblanos. They look amazing. I roasted them on the grill. It took no time at all. It was fun hearing the seeds pop in the peppers. Dinner will be special tonight! Thank you! Yay! That popping sound is so fun. Very tasty! 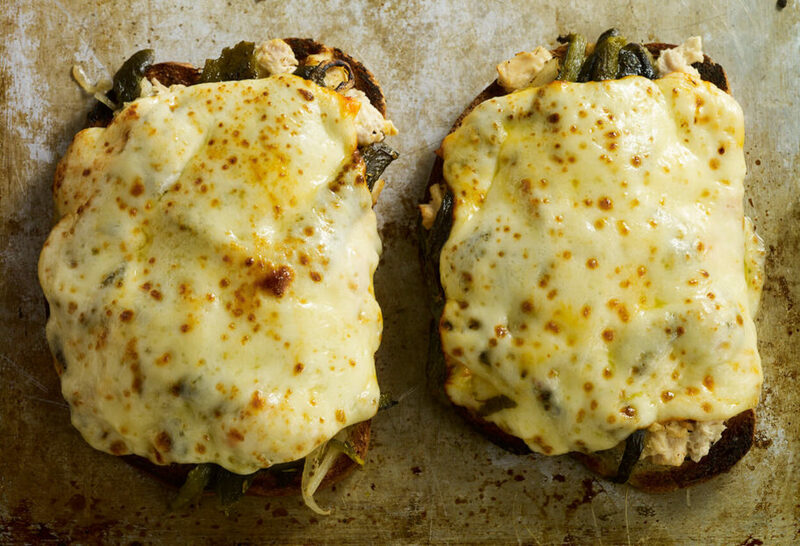 Not one of those “you’ve had them a thousand times tuna sandwiches.” We love the rajas in many dishes. The more I make your recipes the more I am impressed. Thanks. Tnere is no recipe for how to make it .